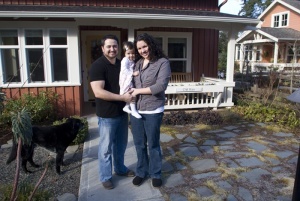 When Elisabeth, 31, and Russ, 33, were married in 2003, they moved into Russ' tract home in a subdivision in Marysville, Washington. "My husband liked his house because it was big and brand new — like the southern California home he'd grown up in," says Elisabeth, who grew up in the older Madrona neighborhood in Seattle. "Russ had no great desire to move, but I wanted something smaller that required less upkeep and had a bit more character." Elisabeth spent close to a year searching online for homes that would satisfy both Russ and her needs, occasionally taking her husband house hunting on the weekend. The older homes that had the charm that attracted Elisabeth all wound up being major fixer-uppers. "We work in construction — roofing, windows, and other home improvements — so we knew that these houses would take a lot of time and money to renovate," says Elisabeth. "We wanted to simplify our lives so we could start a family — not sink even more time and money into upkeep of a home." One day, while driving with her husband to a business appointment in Kirkland, Elisabeth realized they were nearby the Danielson Grove community. She had read about it in a recent Seattle Times article. "I was attracted to the peaceful setting, central to stores, parks and a lot of our work, and look of the craftsman cottages," she recalls. "So, I asked Russ if he would just stop by to take a look." One look was all that it took; they were both sold on a two-bedroom single-story cottage with one bath. It was a new home with top-of-the-line appliances, which Russ liked. But it didn't have that cookie-cutter feel of the typical suburban tract homes. "Russ was so impressed with the quality of materials used, the solid wood doors, and the attention to details that you usually only find in a custom-built home," says Elisabeth, who loved the craftsman style as well as the economy of space. Elisabeth and Russ' biggest concern before moving in was down-sizing from three bedrooms and two baths. But even with the addition to their family of a 21-month-old daughter, born a year after they moved into Danielson Grove, they don't feel like they gave anything up. "In our old home, there was a lot of wasted space, but every inch of our cottage is used — usually for more than one purpose," Elisabeth says. "Even the front porch is like having an extra room where Adela can play. And there's so much green space for her to run around. All of the neighbors know her." Adela has an entire wonderland to explore: one neighbor has ceramic pigs in her yard that the little girl visits with her mother. Another neighbor has a friendly cat that's great fun to pet. A stroll through the luscious Commons garden is always a hit, and there's a public park within walking distance. Danielson Grove wound up being a perfect fit for the entire family.